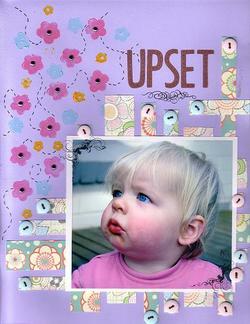 Heidi Swapp has come up with a versatile product that can be used to add a little fun to any scrapbooking layout. Her first realease masks have now been out for around 12 months now, but many scrapbookers still find them daunting so we thought we would take this opportunity to demistify them. A mask is the opposite of a stencil; it is a flexible material with a lightly tacky back to make repositioning easy, and when removed it is the background paper that shows through where the mask had been. Here are a few ways to use a mask. The first 7 are demonstrated in the images shown here. Paint & Paint Brush - Position your mask and then paint across it with a paint brush. This is so simple! Apply Ink - Place your mask on the page and run your ink pad (or ink pads) over the top. This is easier with a smaller ink pad. Texture Paste - Use texture paste in the same way as paint only the texture paste will give you a thicker more textured look. 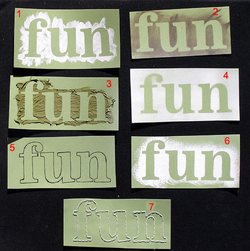 Texture paste can be coloured any colour to suit your pages. Spray Paint - Make sure you do this one outside and protect any areas that you don't want covered in spray paint. 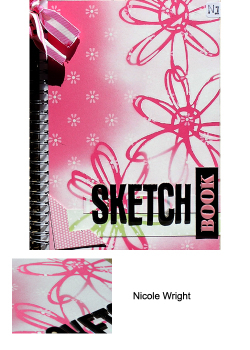 An acrylic based paint is fine for your scrapbooks. Trace - Trace around your alphabet masks for great hand made titles - you could either cut the letters out of patterned paper or trace directly onto your cardstock and leave plain or decorate. Paint & Sponge - Apply paint over the mask using a sponge applicator. Whilst similar to painting with a brush the final texture and appearance is quite different. Use as a Template - Trace around alphabet masks or shape masks and use the trace lines as a template for hand sewing. Chalk - You can apply chalk over a mask but please note that using chalk on your mask will make the back no longer sticky. Attaching - Attach the mask to the layout; simply use the mask itself as a title, an accent or an embellishment for your page. Clearly you loose the ability to re-use your mask in this case. 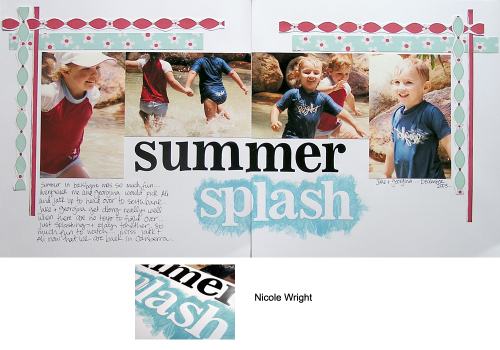 Here in this first layout "Summer Splash" I have used the "Newsprint" Alphabet Mask with paint and a brush for the word splash, giving it a wishy washy look. I have also attached the masks themselves as part of the title to form the word summer. To attach the mask, simply add a little more glue to the back so that the mask wont fall off, or you could sew over the top to keep it in place. 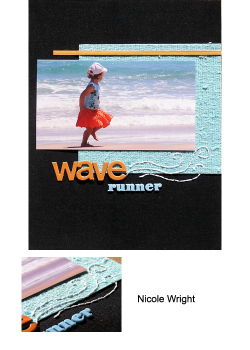 For the layout "Wave Runner", I altered the Horizon mini mask a little to suit what I wanted to do. I simply cut off the parts that I didn't need, and then used the mask as a template for sewing. I attached my mask to the page and then, with an awl, placed holes in the mask as well as my page. I then removed the mask and sewed the pattern to the page. If you don't want to put holes in your mask, simply use the backing sheet that the mask came on - it will have the outline of the pattern of the mask, so all you need to do it place it on your page and use it as a template to punch your holes. For my Sketch Book I have used the Dasiy Mask and spray paint. WOW!!! If you haven't tried spray painting, I'm telling you, you must give it a go! Have a little test run before you do your page or book, just so you get the hang of it. It is fun, and gives a great effect when dry. I have used a matt acrylic spray paint which I picked up from Go Lo for a bargain. I spray painted before I attached anything else but if you are spraying after, make sure you protect anything you don't want painted. AND also remember to only spray paint outside. Read the directions on the can before applying. Once you have had a couple of test runs and are happy with how to use it, lay your mask on your page or book and apply your spray paint to your project.. drying time is quick too. So with so many possible uses, the mask is a great addition to your scrapbooking stash! 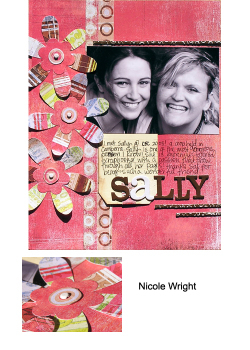 BasicGrey has a great tool called the Notch and Die Cut Tool with three interchangeable magnetic tips for adding slots to your pages. 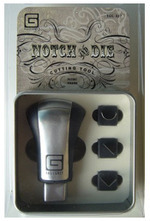 The tip shapes are half-circle, v-wedge and straight-edge and the blades are razor sharp. This tool has been around for a few months now but there are still many people who have not seen it in use. The tool is pretty easy to use - simply mark the area where you want to make your incision, place the tool in place and rock back and forwards a little. Make sure you have a protective self-healing mat under the project area you are working on, and you should emerge with a clean crisp cut. On the layout "Sally" I have used the tool to create a hand made flowers using the half-circle notch tip. First I traced a circle on my page, then I lined the notch tool up, and went around the circle, leaving little gaps in between. Once I finished that I cut out some petal shapes and placed them into the slots that the notch tool created to make a flower, then added a small circle and a brad to create the middle off the flower. The number of petals you will need to complete your flower will be determined by how big you make your circle. 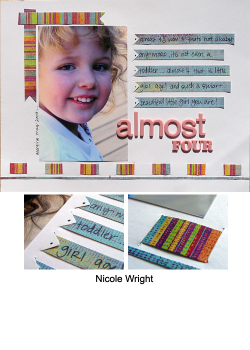 For the layout "Almost Four", I used the triangle shape notch. I cut my paper to look like ribbon and used it as journaling strips at the edge of the photo. I made little triangle slots to slide the strips in to and then attached each strip with a brad. I also used the straight tip along the bottom of the layout so that I could weave patterned paper through the page. 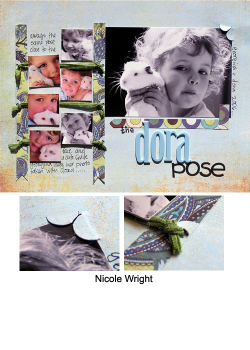 On the layout "The Dora Pose" I have used the half-circle tip to create slots on the edge of each strip of patterned paper. I had a hole in each semi-circle and then strung ribbon from side to side, and then placed some photos over the ribbon. Attaching a title by mounting letters on chipboard or cardstock and then stringing each tile through a notch in this same way is also very effective. QuickStampz is the latest offering from Quickutz and is now available in Australia. I am so excited to be able to share what it is and how it works with you. I'm sure it will be one of the best new tools of 2006! So what is QuickStampz? Well it is effectively a set of tools that come in a cute but sturdy tin, that allow you to use your Quickutz hand tool and dies to make foam stamps!!! The possibilities for making custom stamps is now amazing!! Just imagine paisley stamps, photo corner stamps, alpha stamps, shape, heart and patterned stamps - every die that Quickutz makes can now be turned into a foam stamp. one exclusive shape die - "Accent"
one exclusive Goosebumpz embossing die - "Distress"
All you need is your Quickutz hand tool and we are ready to start. 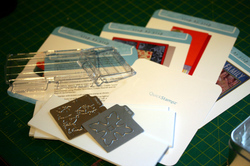 You do not need to use the die that comes with the kit - you can use any of your favourite dies. All you need to do is take your selected die and remove any foam that is currently attached to it (if you have already set the die for normal die cutting), then place it inside your Quickutz tool as per normal. Then take one of the thick sheets of stamping foam and insert it into your tool with the foam side down (and the adhesive side up). Press your tool down firmly and then remove. Pop out the accent or letter, peel off the adhesive backing and position on the rounded size of the rocker. Your foam stamp is now created!! The thing that I really loved about this tool, is how much thought has gone into it's creation. It simply increases the use of the tools and dies that you already own, with the only outlay being the stamping kit which, once owned, will last such a long time with a bit of care. Going forward the only purchases you will need to make are for new dies and stamping foam. The acrylic rockers are fantastic. Because they are not flat, you don’t end up with the corner of the stamp inked up when you press the stamp into the stamp pad! They are also clear so you can easily see where you are placing the stamp on your page, so no mistakes! 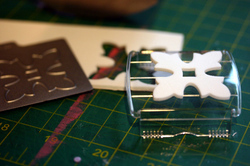 And the absolute best thing are the little grooves which make lining multiple foam die cuts up so easy! Not to mention that because they are plastic they are light and easy to clean! 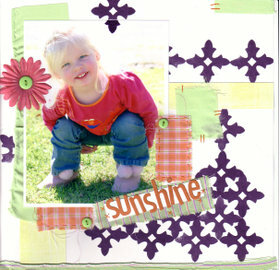 Here is a layout I created using the exclusive die that came with the stamping kit. I love the dark dimension the stamp gave me to create a unique background pattern. It frames my picture and makes the bright spring colours I’ve used jump off the page. To create this, I started with my blank sheet of white cardstock and inked up my stamp, then stamped it onto my page, being careful to line it up with each of the shapes. I left the foam on the rocker so that when the rest of the page was finished I could add the top stamp over the photo. Other materials include: Quickutz Studio Font; SEI Chalk Paper and Kaboom Buttons; Junkitz Baby Blanket paper and Spring Fabric; Heidi Swapp Small Crimson Floral and DMC Cotton. With the second layout I got more creative and used my Flower DooDads die. This die makes three flowers, so I put the large one on one rocker and the two small ones on the other rocker. This way I could start with my large one, then slot the other two in around the first. The flower cosmos at the top looks quite cool, especially finished off with some Carolee’s Creation Brads and doodling! I also tried the QuickStampz on my Studio Font Alphabet and was surprised at how easy it was to get a straight and clear title!! I am definitely one that struggles with lining my foam stamps up, so this was fantastic, and yep, all the letters are the right way round!! These were simply individually cut from the foam then lined up on the long rocker. In one press of the stamp pad the title was done! Other materials include Heidi Swapp Acrylic Paints in Betty, Butterscotch and Sea; Scenic Route Charlotte Eastern Ave Floral Aqua Paper; Sassafrass Lass Delight Paper; Basic Grey Flourish Rub-ons; SEI Sweetie Buttons and DMC Cotton.